The Spring Luncheon is held in June at a local venue. It includes a short meeting and installation of officers. The theme of the Luncheon was Fairy Gardens and each table sported an attractive Fairy Garden in a flat container. These were later given away as door prizes. 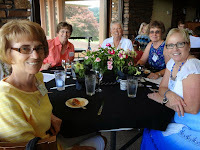 The Luncheon was held at the newly remodeled Lake Point Event Center in Bella Vista. The Raffle items also featured Fairies. An attractive display showcased the many awards the club won in the last year. Other awards/gifts were given to deserving members. 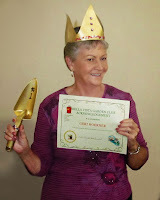 The new officers were installed and given garden tools that represented some of their duties. A video featuring highlights of Tony's term as President was shown and he was awarded the Past Presidents Pin and other gifts. Our new President outlined her goals for the coming year. 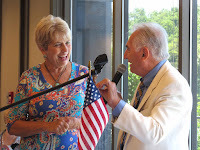 The BVGC Spring Luncheon was held on June 4th, 2014 at Café Amici at the Bella Vista Country Club. Social time started at 11:00 a.m. with a short meeting at 11:30 a.m. followed by lunch. New officers were installed and special awards were given to some of the hard working members including Geri Hoerner (right). Another fun event. 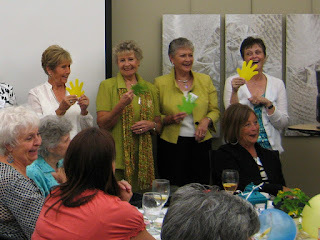 Spring Luncheon was held on June 6th, at The United Lutheran Church. It was catered by the Red Onion. Social time 11am followed by a short meeting, installation of new officers and Awards. 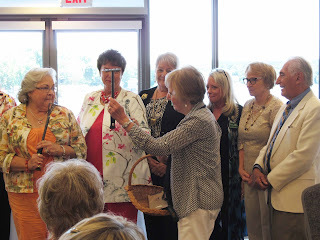 The Spring Luncheon was held at the Northwest Arkansas Community College. 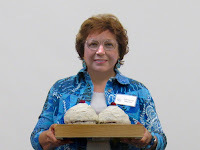 Installation of officers (below right) was followed by a special Cupcake Award (below left). Info and photos not available. 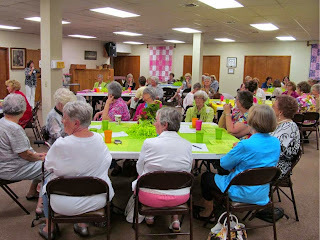 Members enjoyed a lovely lunch and entertainment at the Highland's Methodist Church on June 2, 2010. 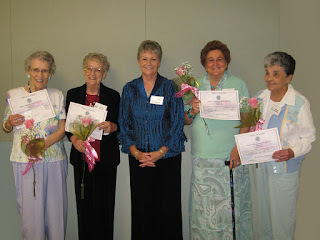 Four members were honored with an AFGC "Circle of Roses" designation recognizing 25 years or more of membership: (left to right) Betty Ream - 30 years; Dotty Nelsen - 25 years; Geri Hoerner, Club President; Lorene Terry - 25 years; and Elaine Brubaker - 25 years. Officers for the 2010-2011 year were also installed. The luncheon was held at the Bella Vista Community Church. A had contest was a highlight along with the installation of new officers.